I really have to thank everyone who has attended these meetings so far. We called it a community conversation.. we wanted to start off something that could reveal where people’s priorities and concerns lay, without creating a feeling we are telling people what to do.. as like anyone faced with the enormity of the cliamte crisis, it is hard to know where to start. This is principle one in permaculture and it made sense to open up a space where we can observe, interact and get a broad feel for what at least those actively engaged enough to attend such meetings are thinking and feeling. Permaculture principle number two guides us to collate and bring together what outputs, ideas and resources we have and begin our work and to arrange them in a way that we can begin to develop to create yields.. which is principle number 3. Obtain a yield: Outputs from BRACE so far. 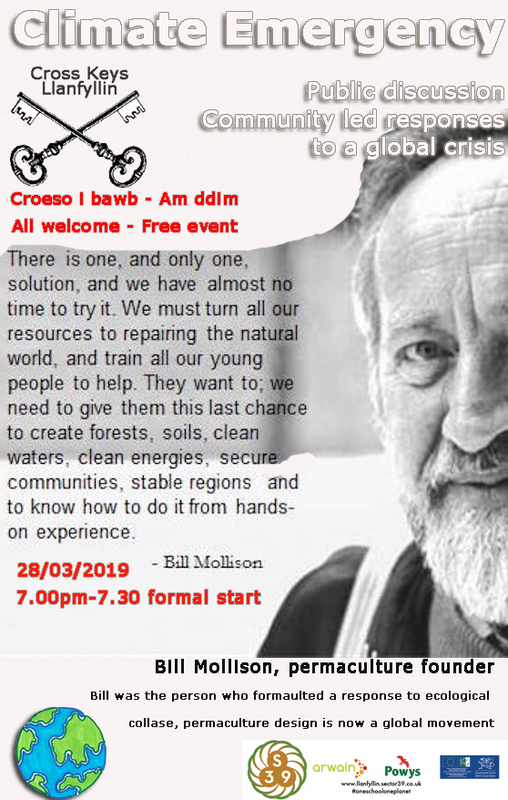 In the last two months we have held 6 open meeting at the Cross Keys Llanfyllin, open house and community space on the theme of ‘Climate Emergency‘. We approached this without any preconceptions about where it would go except to differentiate ourselves from Extinction Rebellion in the sense the XR are about lobbying government and creating a national scale awareness and BRACE is about our Tanat/ Cain valley community coming together to identify and initiate locally appropriate responses to this global reality. What can we do to develop stronger community and to build resilience around key services and functions we all rely on. It has been fascinating, and has felt like we have been exploring new territory all the way. In 2013 Sector39 won sponsorship from the DTI to undertake an energy audit on the Llanrhaeadr community and area. We evaluated 10 different housing types and made recommendations as to energy efficiency approaches to upgrade these housing types. We produced a booklet, which is still available at Dragons. We also evaluated potentials for energy generation in the village drawing on locally available resources. One was a biomass study.. we explored this in context of the new village hall, but it was also identified that a woodchip of pellet system could heat a whole row, or street of houses, eg the row of of ‘senior’ housing by the doctors surgery. Many people in the village are still burning coal and using very inefficient and outdated appliances. There is significant local resource that could be efficiently burned to produce clean, green heat. The scheme with the greatest potential was community micro hydro. In brief there is enough energy coming our of the Rhaeadr valley to power half the village or there about. Coupled with energy efficiency measures this could become very significant. Micro hydro means taking a max of 20% peak flow from smaller streams and feeder rivers and sending down a pipe to a turbine where power generated is then returned to the grid and generates a Feed in Tariff. In 2013 when the survey was undertaken the figures were something in line with an investment of £250,000 would generate a financial return of 6-8% for investors. A sound way forward for a community pension plan. FIT revenue would run a business plan that would install, maintain and replace components as and when required whilst returning a surplus of £4,000 – £6,000 back to the Llanrhaeadr community. This business plan sits on the shelf gathering dust and was put together by Share Energy Co-op and local specialist who develops community energy schemes. The reason it sits on the shelf is that certainly in 2013 Sector39 were not ready to push this forward. The scheme would require a community wide view, investment and works that would cross land owned by several different farms and holdings. It would need a big joined up plan and wide support across the community. Are we ready for this? The proejct would need champions, a team to drive it forward who also have deep connections across the community. Maybe the time for this is now, we were warned that such schemes take about three years from drawing board to completion. Transport is an area we are all vulnerable. Cars are not efficient, increasingly expensive and in our rural community we are very car reliant. What options do we have to make car ownership more accessible to all of us? Llanidloes have a car club model that works well for them, and this is well worth investigating. Basically the car club acquires possibly a small range of vehicles, depending on demand, hatch back, family saloon, van type thing and they reside in the local car park. Anyone who pays a deposit and has a valid license can join the club and can access the vehicles on demand, pre-booking via a Google calendar type app when required and paying by the mile. A per mile cost, including fuel is calculated by the club and you account is billed for the journeys you make. Feedback from the scheme members is positive, it works, ‘it meant many of us could shift from a 2 car to a one car family, if not getting rid of the car entirely’. Step up if you would like to champion this idea and take it forward, I can connect you to the Llanidloes group and there is a possibility to use this model in any rural town or village. In 2012 – 2015 sector39 was a lead partner in the Get-growing project which led to the formation of the community co-operative Cultivate. this was a three year Big Lottery proejct to develop food growing hub, to demonstrate permaculture and organic horticulture techniques. The project created 4 part time jobs over that period and developed three sites as community growing hi8bs. The principle site is Pen Dinas, in Newtown, adjacent to Coleg Newtown and has become a hub for community growing, training, micro allotment plots and much more. The satellite gardens were developed in Llanidloes and in Llanfyllin. This was the first step of the Cae Bodach heritage orchard and this in turn has served as an effective focus for future growing work in Llanfyllin. We think it is time to back to the big lottery and to submit a bid to run a similar set of project objectives, but this time with Llanfyllin as a the hub and creating satellite gardens in at least tow of the villages nearby. The Newtown project was centered on a key community volunteer day each week, with a communal lunch cooked by volunteers and using produce grown by the project. this was a really effective way to bring volunteers and project members together and to build momentum and share ideas. The S39 team have begun on this application and are really open to input from anyone interested in this project. One of the ways the BRACE group has proved really useful has been in generating ideas and sharing information about the many community groups that might benefit from such a project and the patchwork of sites in and around the area that might benefit from input and management from such a scheme. This idea sits very closely to the food growing and orchard project. The fact that we are putting things like cardboard packaging on lorries and emitting carbon and wearing the roads to take it away seems crazy when it is none hazardous and could easily be composted mixed with things like grass clippings to create a quality growing medium. Time didn’t allow us to discuss this proposal last night but One school One Planet have resources to run a series of workshops in both the school and the Cross Keys on food culture. We have the amazing Annie Levy, a friend of the proejct who resides in Llanidloes and who writes the brilliant Kitchen Counter Culture blog exploring the interconnections of climate and weather, food, tradition and diet, worries and hopes. Sessions covering traditional diets and cooking, food preservation, fermentation, waste reduction, fruit vinegars, sour dough, kombucha, keffir and more are all possible. Please let us know if any of this interests you. This idea sits somewhere between the car club idea and the community energy scheme. It could be another community investment opportunity to acquire electric vehicles that could also be managed by a car club that also tap into locally sourced (purchased over the grid) green tariff energy. Again much scope here to think about totally different models for car ownership, lift sharing and community investment. Any scheme that encourages community members to withdraw savings from mainstream banks and investment scheme to put it to work in their own community for broader community aims is of great interest to this proejct and this is another idea that needs to be taken forward. the antidote to the throw away society is for us to learn how to fix things. there are people out there with the skills to do it and skills to share. understanding basics and having a few tools and nimble fingers can get us a lot of the way there. plus for clothes, up cycling, altering and repairing is also a huge way to save money, resources and make new friends. There is already local progress apparently on local shops swapping plastic for biodegradable containers. there is enthusiasm in the group to drive this process forward, and are collection suggestions for next steps. Local media, social media, national media, attending talks, events and shows. BRACE hopes to get itself out there and to engage with the community any way we can. Thanks to everyone who has attended so far. I am really grateful for the effort people have made to share their ideas and progress this far. Many thanks to those who donated to BRACE and XR Oswestry by attending the Swervy world gig in Llanfyllin last week. We have been presented with £120 towards the Cae Bodfach proejct from this event, we will be putting this money to good use! Open to suggestions as ever. Hope I caught everything from the list, I thought it was our most productive meeting yet as it gave us a chance to pull together the many threads so far teased out.